In London restaurant terms there are few restaurants with the long-running envious reputation of The Ivy. Known for its simple, delicious menu and as a favourite watering hole for celebs, it’s hard to get a table at this London institution. 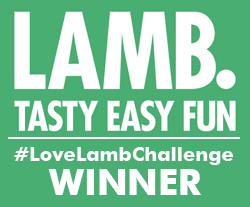 I’m lucky to have eaten there a few times over the years and love the feel of the place, their classic dishes and the fact that there’s plenty of celeb spotting to be done, just remember to be cool about it! I once spotted gold-medal winning figure skaters Torville and Dean there and convinced myself that I recognised them from school. Luckily my friends arrived before I’d gone over and asked them if they were from Zimbabwe…narrow escape. It’s a special place that I think should be on everyone’s restaurants-to-go-to list. And now it has a new baby sister down the road, right on the edge of the Covent Garden piazza. This is a somewhat different proposition – it’s open all day and although you can book a table, it’s designed as a walk-in spot for any time, breakfast, lunch, dinner or a pick-me-up cocktail along the way. 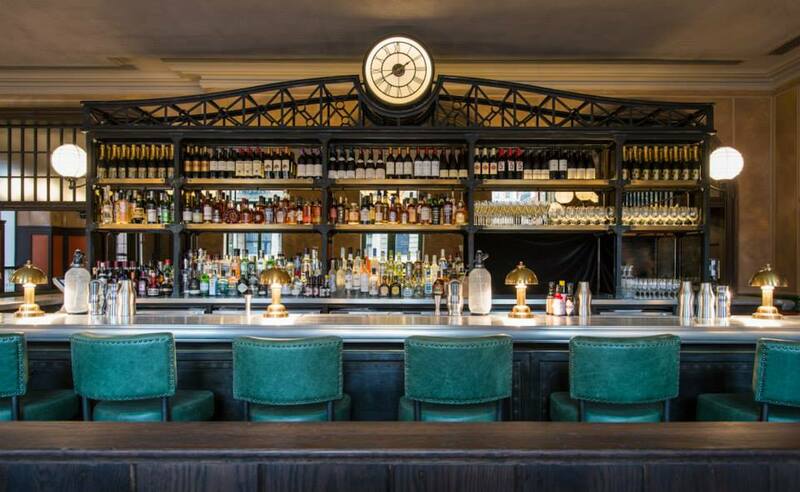 It’s certainly got that Ivy feel about it: plush with a long welcoming bar lined with beckoning bar stools, plenty of wood and a menu offering lots of old favourites. Plus plenty of new stuff with a breakfast/brunch menu packed with indulgent choices. 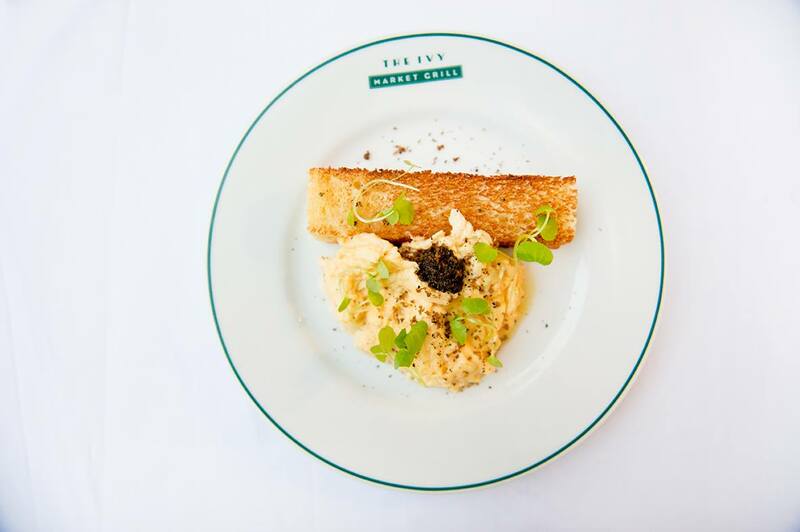 Like the truffled scrambled eggs…now that’s the best way to start the day. 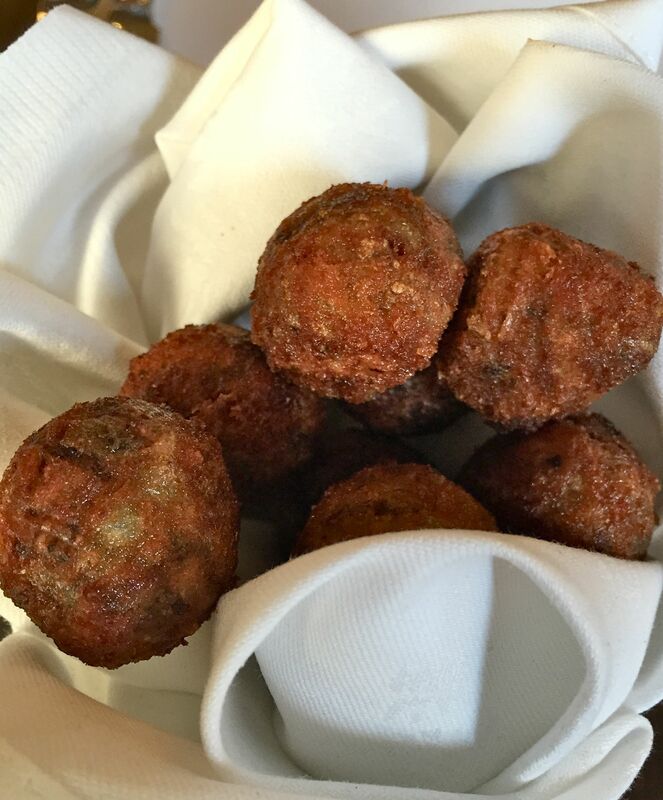 Keeping on the truffle theme, you can nibble on some truffle arancini while you’re poring over what is a tempting and comprehensive menu. Cheesy, truffly, piping hot and yummy. 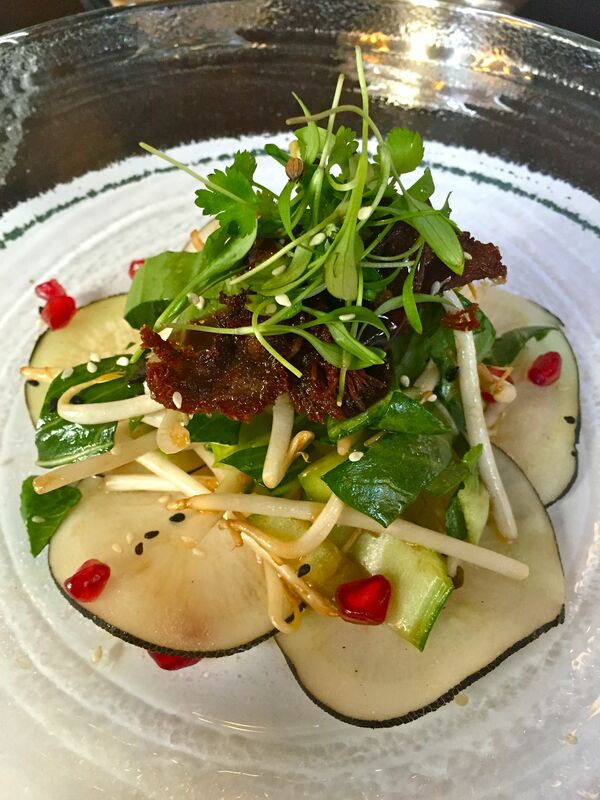 One of my favourite starters from The Ivy is their crispy duck salad…so I had to order it here. A slightly different take from the one I remember, but equally as delicious…so much so I wished the duck on my plate had been doubled. You can’t go wrong with a classic carpaccio. 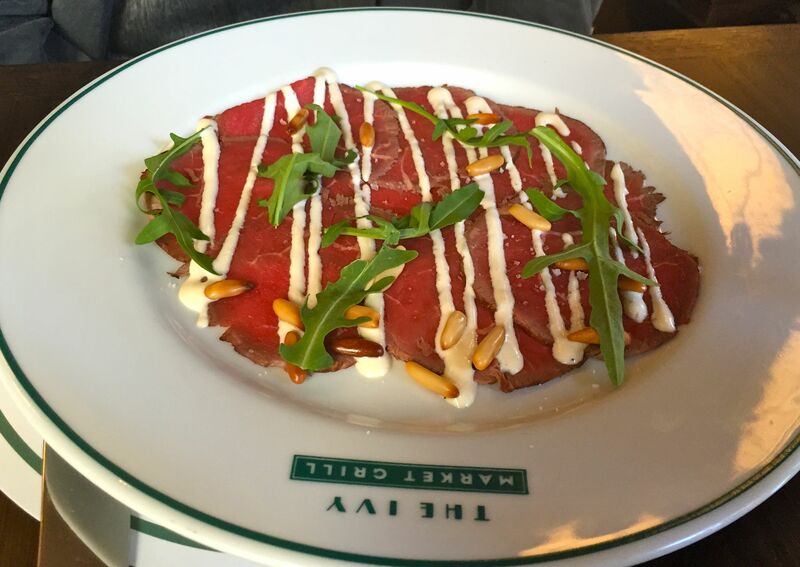 This is made to the original recipe for the famous raw beef appetiser which was created by Giuseppe Cipriani, founder of Harry’s Bar in Venice. It’s served with Cipriani dressing, toasted pine nuts and rocket. 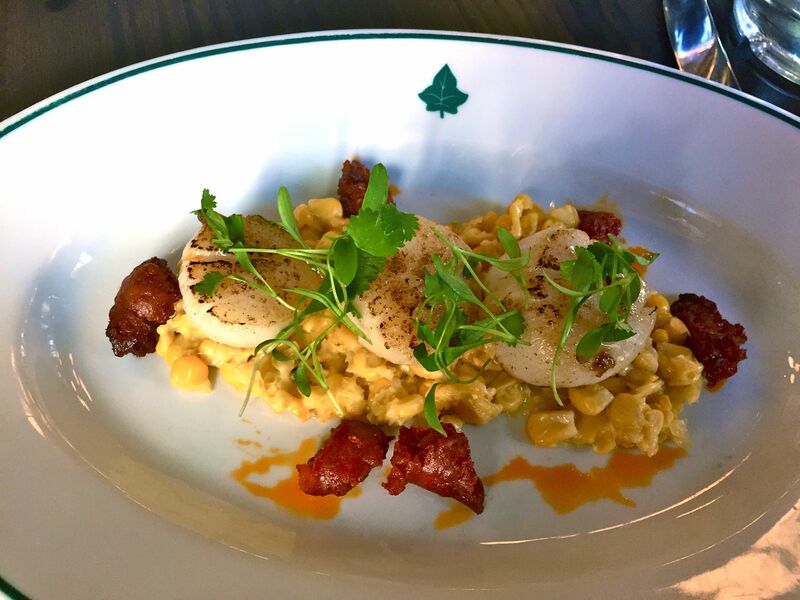 I’m rather a lover of scallops and serving them with chorizo totally works for me. Perfectly sweet and melt-in-the-mouth, they were served on a bed of creamed corn, the perfect complement to the crispy chorizo. 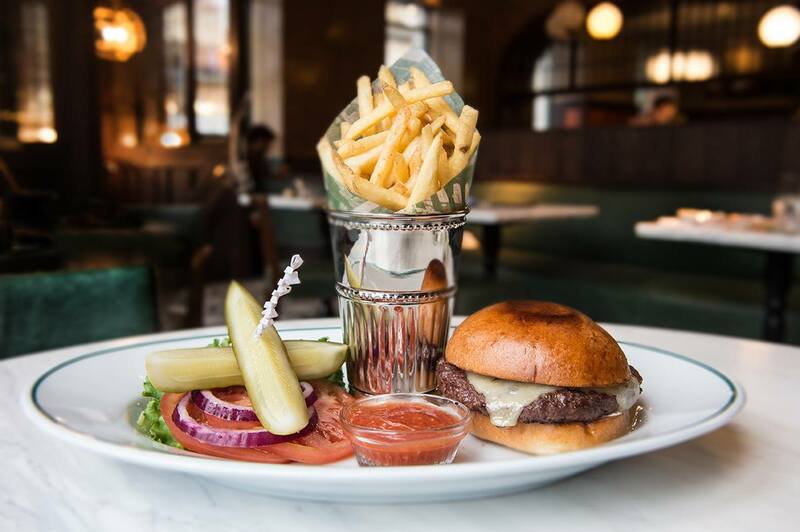 There’s no shortage of staples on this menu either, like their delicious burger which is served with style. And here’s a look at the bar. The kind of bar stools I reckon it’s hard to get down from once you’re settled. Welcome to Covent Garden, Ivy’s little sister…we’re happy the family is growing. The Ivy Market Grill is at 1 Henrietta Street, Covent Garden. It’s open Monday to Friday from 7am to midnight, Saturday 8am to midnight and Sunday 8am to 11pm. PS The Ivy itself is closed for renovations until 1 June 2015. PPS There’s also another baby Ivy opening in Chelsea.